Last weekend, I was in Torino, Italy for Salone del Gusto — the biannual Slow Food festival. On Sunday, I took a break from the food and went to the National Cinema Museum, also in Torino. And it was there, in the gift shop, that I bought a Blob t-shirt! As it turns out, the Blob is pretty well entrenched in Italian popular culture. One of the installations on the relationship between cinema and television included video loops running on various television sets dedicated to different decades. Amazingly, the loop dedicated to the 80’s includes the scene from The Blob when that oozing mass of fluido mortale overtakes the projection booth and the balcony! 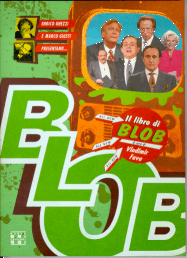 Apparently, in the 80’s, a satirical news show (think Talk Soup meets The Daily Show) called The Blob debuted on Italian television. And, it’s still on! Unfortunately the show’s website does not have an English version, but you can visit it, nonetheless, by clicking here. You can watch clips of the show on the Italian televison network’s site. The cinema museum is housed in an extraordinary building called La Mole Antonelliana that was built in the 1870s. The architect had intended the building to be used as a synagogue, but before construction was completed the local government purchased the building with the intent of using it for some civic and national purpose. In 1941, historian Maria Adriana Prolo donated her collection to create the national cinema museum which was moved into La Mole Antonelliana in 2000. National Cinema Museum in Torino.